Obituary – Krause, Vivian (Brengle) « Perry High School Alumni Association, Inc.
﻿Memorial services were Wednesday afternoon at Holy Trinity Episcopal church at York, Neb., for Vivian B. Krause, 90, former Perryan, who died Sunday at York. Rev. Joel Lundak officiated. Burial was at Rose Hill cemetery at Albion, Neb., under direction of Metz Mortuary. Mrs. Krause was born at Perry, Sept. 15, 1894, the daughter of William and Grace (Liddle) Brengle. 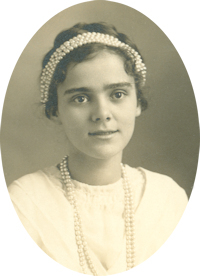 She was married to Harold Krause Sr. at Perry on June 10, 1921. Krause preceded his wife in death in 1983. Mrs. Krause was a graduate of the University of Oklahoma department of music. She taught voice and piano for 62 years, most of which were at Fullerton, Neb., where she had made her home before moving to York six years ago. Among survivors are one son, Harold Krause Jr., West Covina, Calif.; one daughter, Mrs. James ( Betty) Bell, York; five grandchildren and five great-grandchildren. She was preceded in death by her parents and two brothers in addition to her husband.